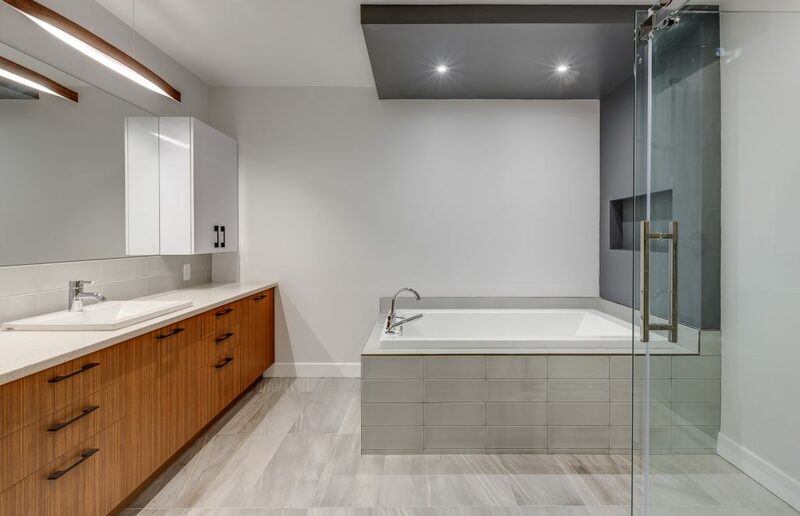 Take a look at this modern bathroom renovation project in a Longueuil house. 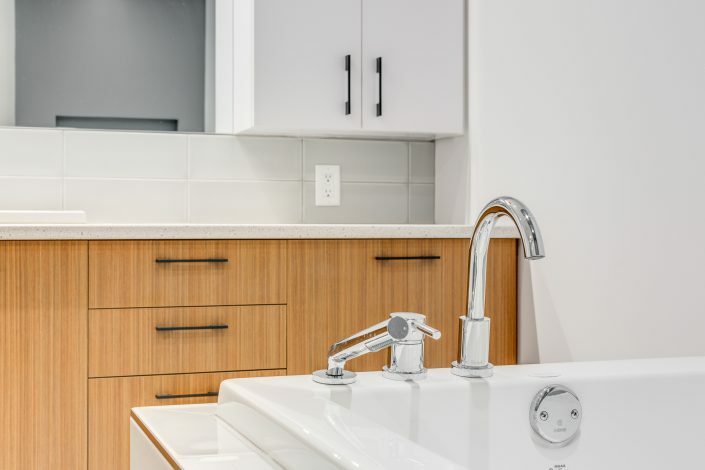 You too can benefit from our expertise as a general contractor in bathroom renovation and our turnkey renovation services. Call us for a free consultation! For this bathroom, our client wanted a luxurious touch while keeping simple lines, for a very refined style. Therefore, we opted for shades of grey and white, as well as lighting that highlights the different parts of the bathroom. First of all, with the customer, we chose a vinyl floor with a natural stone pattern. 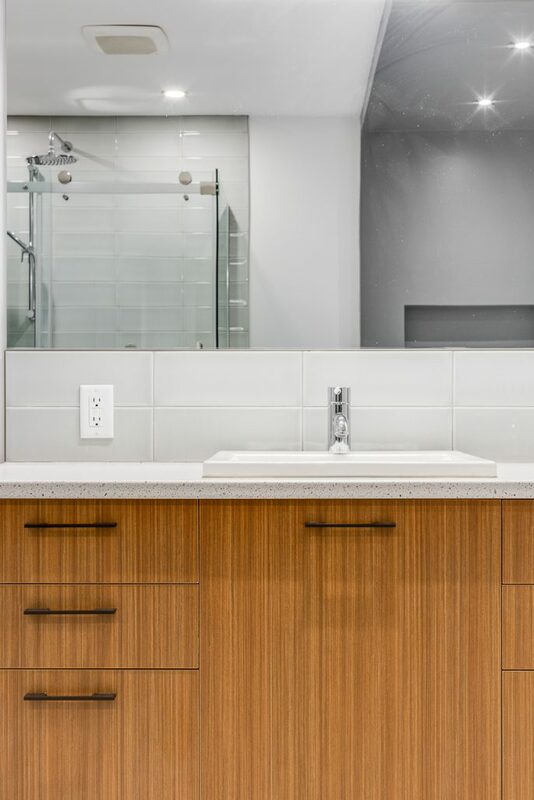 Subsequently, we added a custom vanity with cabinets in an imitation wood finish for more storage. 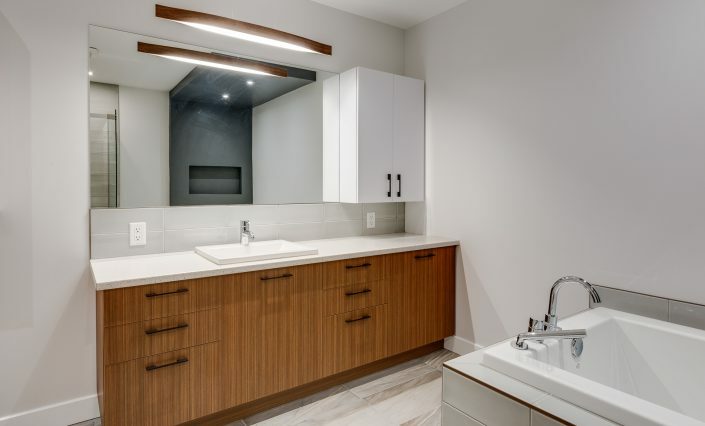 The customer chose a full-length mirror with two custom cabinets for maximum storage. Finally, a white ceramic backsplash completes this part of the bathroom. 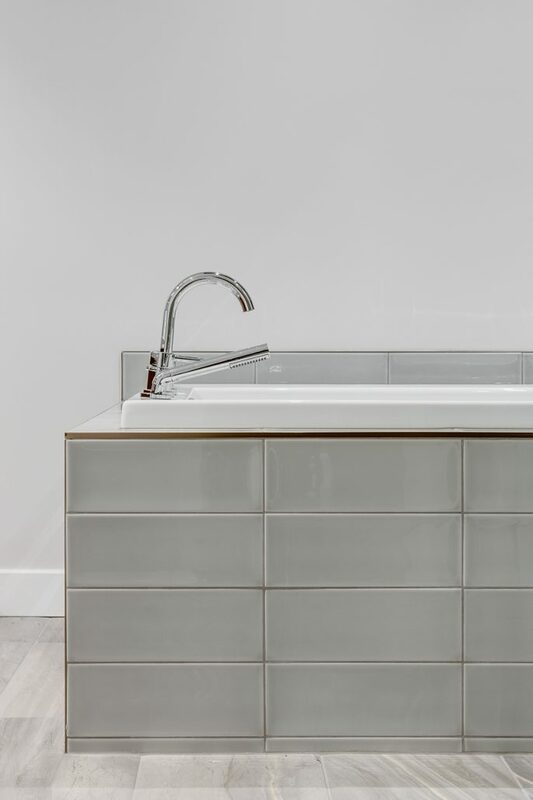 The centrepiece of this bathroom is undoubtedly the bathtub. 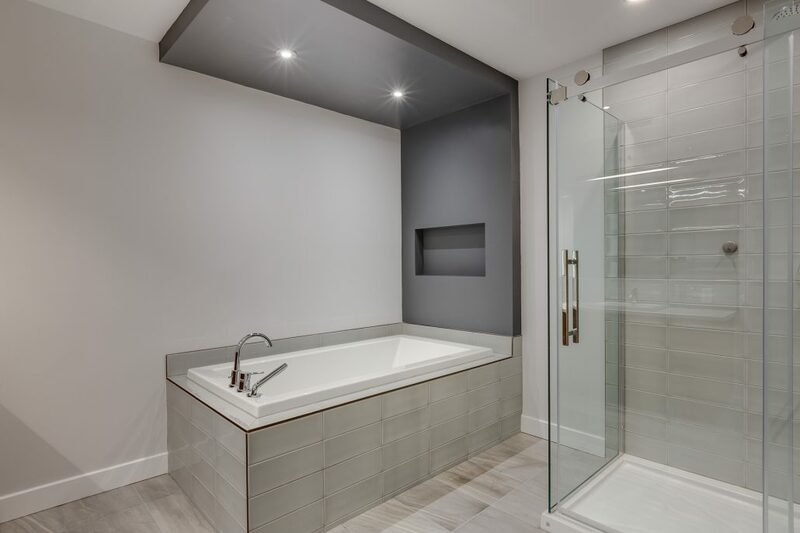 The customer chose a custom recessed bathtub with grey ceramic with chrome finish faucet and hand shower. We have integrated a contrasting dark grey wall with a small storage shelf and discreet lighting above the bathtub. 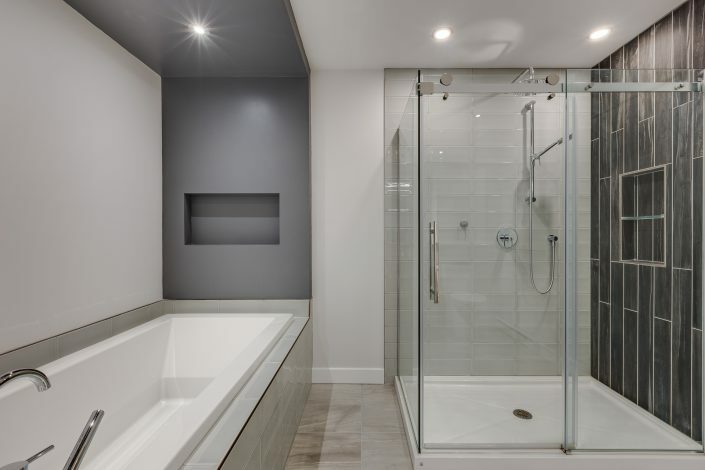 We added a double recessed shower with rain shower head, a white ceramic wall and a vinyl wall with stone pattern. 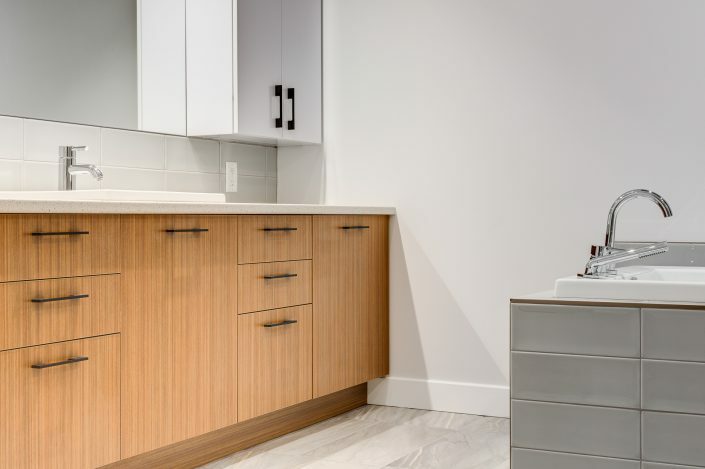 As a general contractor specialized in kitchen renovation, we deal with a multitude of renovation specialists, such as interior designers, woodworkers and cabinet and bathroom countertop manufacturers. These partnerships have allowed us to offer our client a customized bathroom that takes into consideration their space, budget and schedule. If you would like to have more details about this kitchen bathroom renovation project in Longueuil, about our turnkey bathroom renovation services, about our prices, or about our services, don’t hesitate to contact us by email or by phone. Your first consultation is free! Our team will be happy to welcome you and answer your questions.